Champagne is primarily made from three grapes: Chardonnay, Pinot Noir and Pinot Meunier. True. There are also other approved grapes that for historical reasons are grandfathered in as approved varietals, including white Arbanne, Petit Meslier, Pinot Blanc and Pinot Gris. However, usage of these varieties is uncommon. The bubbles in Champagne are formed during a second fermentation that takes place in the same bottle that you purchase the Champagne. True. This is what makes Champagne different than other sparkling wines such as prosecco. 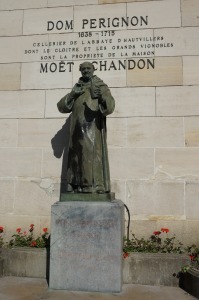 Dom Perignon was a blind Benedictine monk that created Champagne in 1692. F alse. Dom Perignon was not blind. He “blind-tasted.” And he did not invent Champagne. In fact, Dom Perignon was originally trying to determine how to keep the bubbles out of his wine. 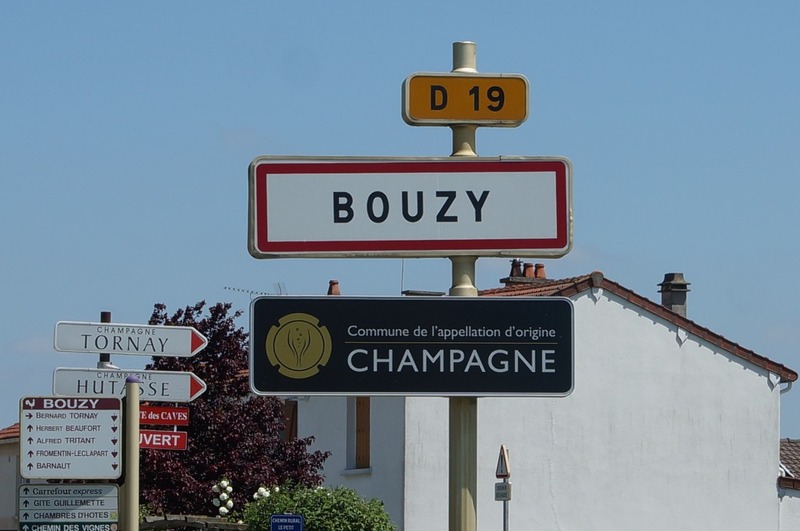 The Champagne region of France has a very cool climate and grapes did not have enough time to fully ferment into wine before the cold winter weather. The fermentation would stop in the winter only to be “woken-up” in the spring – hence the bubbles. Dom Perignon is considered the father of the modern Champagne industry, and he’s credited with several key advancements including introducing English bottles that could withstand pressure of fermentation and using corks as closures. The English invented Champagne in 1662. True. The English were actually importing French still wine in barrels and purposely making it into sparkling wine. Th ey would bottle the wine with a little additional sugar or molasses to cause the second fermentation that creates the bubbles. The first mention of a deliberate, second fermentation in bottle was in England in 1662 — several decades before the French claim to have made the first Champagne. The English determined how to make glass bottles that could withstand the pressure of the second fermentation in bottle. 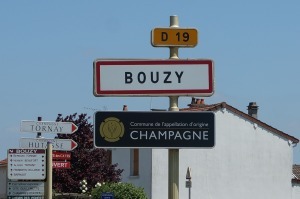 And the first French Champagne house dedicated to making bubbly was not established until 1729, some 50 years later. The pressure inside a bottle of unopened Champagne is approximately three times the pressure inside a car tire. True. This is why you need to be careful when you open a bottle of Champagne! You should swirl a glass of Champagne to best assess the aromas. False. Sw irling the glass will make the bubbles disappear faster. You swirl a glass of still wine to release the aromas. Champagne’s bubbles carry the aromas to the surface, so there is no need to swirl. Champagne should be stored on its side for long-term aging. False. Like still wine, Champagne should be stored at 55 degrees and away from light and vibrations. But unlike still wine, Champagne bottles need to be upright for long-term storage. The pressure from the trapped gas (better known as bubbles) creates enough humidity to keep the cork from drying out and protects the bottle from the introduction of oxygen. Studies have found that Champagne stored on its side ages quicker because oxygen can seep in as the cork losses its elasticity due to contact with the Champagne. A large bottle of Champagne that holds 16 individual bottles is called a Balthazar. True. The different size bottles were named after historical and religious figures. Balthazar was one of the three wise men to present gifts to baby Jesus. Ruinart was the first recorded Champagne-making house in 1729. True. The modern Champagne industry dates back to 1728 when Louis XV removed the restriction on transporting wine in bottles. Other notable houses include: Moët & Chandon (1743), Delamotte (1760), Veuve Clicquot Ponsardin (1772) and Louis Roederer (1776). Veuve Cliquot was responsible for the first Brut Champagne in 1874. Even her staff was opposed to the idea.False. Madame Pommery launched the legendary vintage of Brut Champagne for the English market, which was looking for lighter and less sweet wines. At this time, most Champagne was very sweet. 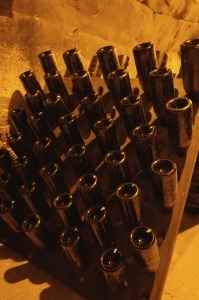 Veuve Cliquot is credited with solving the problem of removing the sediment created by the second fermentation in bottle through the use of riddling — slowly rotating the bottle from horizontal to a vertical position for several months to collect the sediment in the neck of the bottle. This season, give your friends, family and colleagues a reason to raise their glasses– fill them with delicious Champagne! Double Decanted offers a curated selection of Champagne, as well as other wines, at a variety of price points. For assistance selecting the right bubbly for your holiday celebrations, contact Kelly Prohl at Kelly@DoubleDecanted.com.